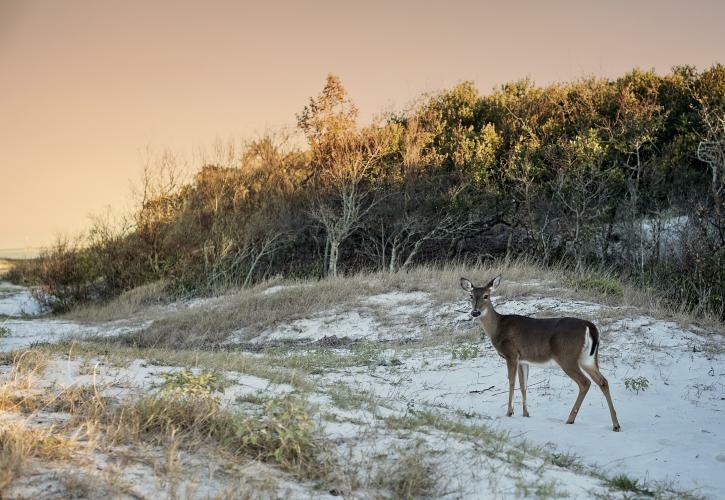 History and nature lovers alike will love camping at Fort Clinch State Park. The fort was built between 1847-1869. Construction began right after the Second Seminole War, and the fort was named for General Duncan Lamont Clinch, a general in the War of 1812 as well as the First and Second Seminole Wars. The area was previously used as a fortified stronghold for Spanish forces during their occupation of Florida and has been considered a valuable strategic area, as well as a beautiful coastal destination, since the colonial era. In 1861 during the Civil War, Confederate forces seized the fort. They used it as a safe haven for blockade runners until 1862 when the Union retook it. The Civilian Conservation Corps restored the fort in the 1930s to its Civil War appearance. Today, this state park offers visitors a glimpse into the history of the site as well as a great place for outdoor activities of all kinds. It is a convenient and enjoyable place for RV camping and outdoor enthusiasts. Campsites can be reserved year round. Reservations can be made through Reserve America up to 11 months in advance. The park entrance is open year round from 8 a.m. to sunset. There are 51 sites for RV Camping. They are all back-in sites, but they range in length from 27-45 feet and offer a mixture of 30 and 50-amp hook-ups. Most of the designated camping sites will accommodate 40 feet, but you will want to make sure you reserve the proper site. Campsites are comfortable and equipped with a fire pit, picnic table and potable water. Dump station facilities are free of charge to registered campers. The camping fee is $26 per night, plus a non-refundable $6.70 reservation fee. 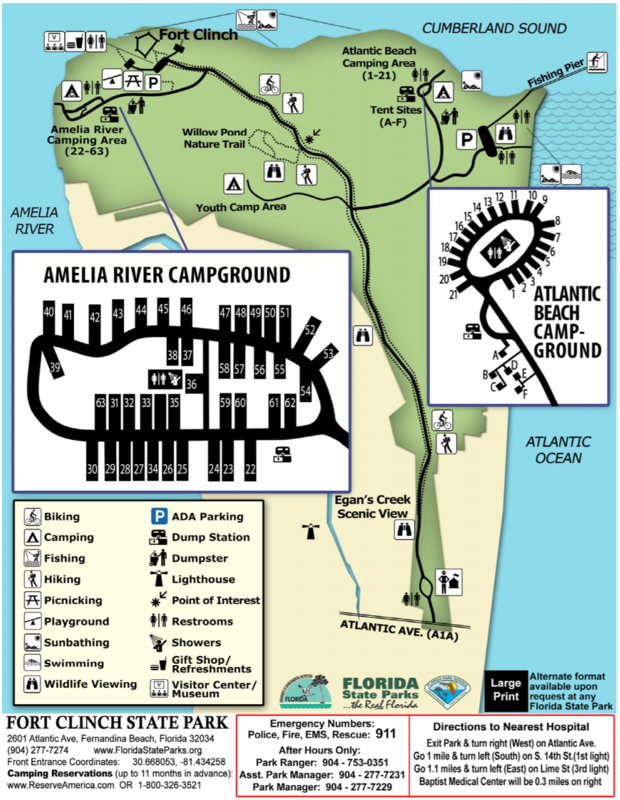 This includes access to water and electricity at the Amelia River and Atlantic Beach campgrounds. Pets are welcome at both campsites. Start your trip at the historic fort which is one of the best-preserved 19th century forts. Inside you can visit the historic prison and barracks, five bastions, the guard rooms, and a number of the workrooms within the fort. A museum also helps put the fort into its proper historical context. The beaches in the park are spectacular, and they offer visitors great opportunities for beachcombing and shelling as well as sunbathing and swimming. Many collectors visit the area to find fossilized shark teeth. These fossils are often found along the shoreline adjacent to the fort, whereas shelling is best in the areas north and south of the jetties. Hikers will enjoy the trails within the park. The main trail is six miles, and you will walk through ancient sand dunes and thick forests. The Willow Pond Hiking Trail loops around a series of fresh water ponds where you are likely to see alligators and deer as well as a variety of birds. If you hike along the beaches of Cumberland Sound, you can stand on the northernmost tip of Florida. Sometimes you can even see Cumberland Island’s wild horses across the sound. Birding is popular in the park. Over 100 species call the area home at some point during the year. Common sightings include woodpeckers, red-tailed hawks, barred owls, and a number of different shorebirds. People also love surf fishing in the park along the Atlantic shoreline and St. Mary’s Inlet. Redfish, black drum, whiting, sheepshead, and flounders are common depending on the season. The park does not sell fishing licenses, so make sure you have a Florida fishing license before you enter the park. 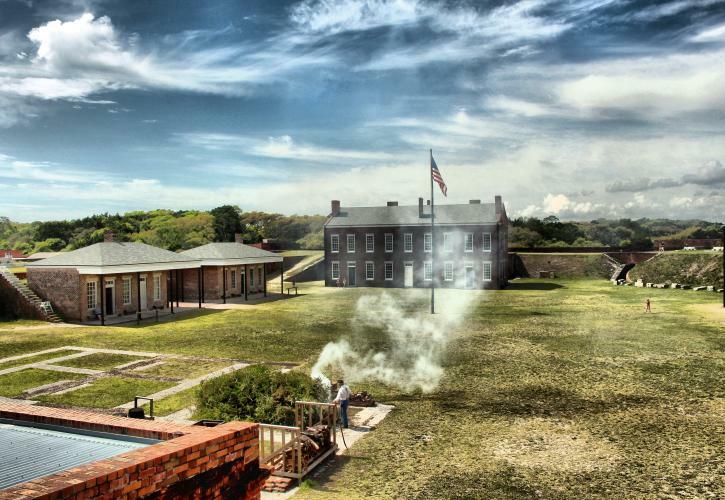 There is so much to do at Fort Clinch State Park. Plan an RV camping trip today to see all that the park has to offer! For more information on the park or to reserve a campsite, please see the Fort Clinch State Park page on floridastateparks.org or call 904.277.7274.